"Hi ... I have the Sony Bravia KDL-46HX820 3D Smart LED/LCD TV and it has one usb post on the side of the TV . How do you go about watching or loading DVD movies from a usb flash drive stick to the TV ? Do I need some sore a player to recommends the usb stick , Is their any video as to how its done ? I don't want to buy another DVD player considering of my broken one. Thanks"
Surely, it's not necessary to purposely buy a DVD Player just for watching DVDs on Sony Bravia TV. In fact, with the advanced technology, it’s possible to rip and copy DVD movies to a USB drive then play them on Sony Bravia TV with the USB drive plugged in. We can make all this happen with the aid of a top DVD Ripper. Brorsoft DVD ripper is such a magic tool to help you convert DVD to Sony Bravia TV supported video formats with fast ripping speed and high quality. In addition, this DVD ripping tool can also convert DVD to various popular video formats like AVI, MP4, WMV, MPEG, MOV, FLV, MKV, 3GP, etc. as well as rip DVD to optimized video for playback on iPad, iPod, iPhone, Zune, Creative Zen, Archos, iRiver, Blackberry, Xbox 360 and more. If you are a Mac user, you can turn to Brosoft DVD Ripper for Mac. 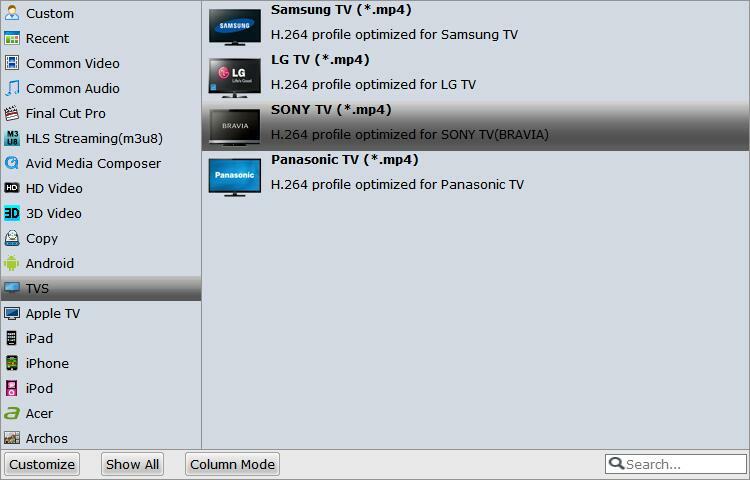 Click Format bar to select a proper format like H.264 MP4 from Common Video profile, which can be viewed on Sony Bravia TV perfectly. You can also select best format for Sony Bravia TV. Click the drop-down button on the right side of the “Format” to select suitable formats from “TVs” Category. Click the Convert button at the bottom-right corner of the interface to convert the DVD video file to your Sony Bravia TV. This Video Converter will finish the DVD to Sony Bravia TV conversion in just a few minutes. After conversion, you can transfer all the output files to a USB drive and then play them on Sony Bravia TV via a USB cable. Brorsoft provide powerful DVD encoder, decoder and converter. DVD Ripper and Blu-ray Ripper can rip and convert DVD movies to Samsung TV compatible videos; Video Converter Ultimate can convert any Blu-ray and DVD as well as any videos to Samsung TV compatible videos. It’s easy to use, and performs professionally. Meanwhile, all the programs mentioned above have TV profile preset, you can rip DVD/Blu-ray movies and convert any kind of videos to Samsung TV as well as LG TV, Sony TV, Panasonic TV directly. You can watch the 3D/2D Blu-ray to your Samsung TV with 3D effects.